Thunderstorms are terrifying for many dogs. Dogs with astraphobia -- fear of thunder and lightning -- can be immobilized by their fear. They might hide under furniture or try to crawl into their owners’ laps for comfort. Some dogs with astraphobia might actually hurt themselves in their fear. With training and natural remedies, you can help such a dog to cope. Only in extreme cases should you use medication to calm a dog, and then only with your vet's guidance. A dog that fears thunderstorms is a dog at risk. He may bite at himself or he may scramble to a place of safety in your home, such as his crate or the bathtub. He may also run out of your house through an open door or window, becoming lost in the storm. Astraphobia can cause a range of behaviors, from mild anxiety to consuming panic, making it difficult to determine an effective treatment. A dog who is experiencing physical discomfort from static electricity or who is afraid of lightning flashes, for example, will require different treatment from dogs who are afraid of the sound of thunder. Astraphobia is a potentially complex disorder. It may result from a simple fear of the sound or the flashing light caused by a thunderstorm or a conditioned response caused by an owner reassuring him when he is startled by these components. It is also possible a physical component exists to astraphobia some dogs might respond to air pressure changes or to static electricity discharges from lightning strikes. Some owners unconsciously reinforce their dogs’ fear of storms by attempting to comfort them during the storm. While it’s natural to want to comfort a dog, giving your dog treats or reassurance tells him that his fear is legitimate. Model calm behavior for your dog, as he can pick up on your fear and discomfort. Natural calming remedies can be effective treatments for mild to moderate anxiety associated with thunderstorms. Using massage to ease the dog’s tense muscles and to communicate your own state of personal calmness to him might be helpful. A dog-appeasing pheromone diffuser, which delivers a calming pheromone released by a female dogs shortly after whelping her puppies, can also relieve anxiety in some dogs. You can try oral astraphobia remedies. With your vet's approval, consider adding Bach flower or melatonin to the dog’s water or food, or place it directly in his mouth. Rub Bach’s Rescue Remedy, a flower remedy, directly on a dog’s ears, nose or paws. These remedies are fairly quick to act and can help a dog relax, especially if he has mild anxiety; however, they are ineffective for treating severe anxiety. As with any kind of medication, you should consult your veterinarian before giving your dog any type of supplement or remedy. It is possible to help a dog with mild to moderate astraphobia through training and manipulating his environment. Teaching your dog that he is not in danger may be as simple as encouraging him to play with a toy throughout the storm. Undertaking some basic obedience or trick training, and showering him with treats for good behavior, will help your dog focus his attention on you and away from the frightening noise. Using a recording to desensitize your dog to thunderstorms between storms may be of some benefit. Desensitizing consists of playing a recording of a storm at gradually increasing volume and teaching the dog to relax at each ascending level. However, desensitizing only acclimates him to the noise the storm makes and not to other potential effects, making desensitizing potentially less effective. Provide your dog with a small, comfortable space to retreat to, such as a crate or a pillow under a table, to help him feel more secure. 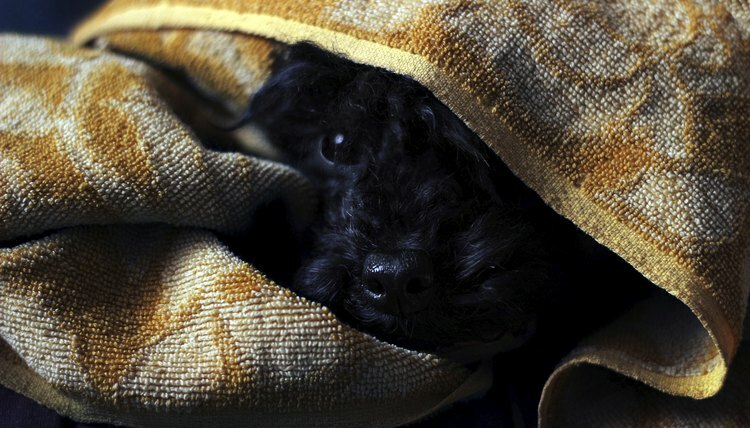 Some dogs like to hide in a bathtub, possibly to escape the static electric charge caused by lightning. Keeping curtains or shades drawn over the windows, will prevent your dog from seeing lightning flashes outside, if they are causing his fear. Soft music, sounds from the television set, or white noise recordings may counteract the effects of storm noise. Some dogs benefit from body wraps and caps during a thunderstorm. Snug bandages and compression wraps can reduce a dog’s anxiety, just as swaddling cloth reassures an anxious infant. A variety of such garments -- the Storm Defender cape, the Anxiety Wrap, the Thundershirt -- exist at retail. The Thundercap is intended to reduce a dog’s anxiety by reducing what he can see during a storm. Medications mask and relieve the symptoms of astraphobia but do not cure astraphobia or help your dog feel any happier. However, dogs who have persistent anxiety or extreme anxiety may need medication to help them cope with astraphobia symptoms. Medication is most effective in conjunction with training and coping methods that help dogs relax and focus. If all attempts at training and calming your dogs have failed, and if your vet thinks your dog will benefit from them, she can help you develop a treatment plan that includes anti-anxiety medication.